Surprise! 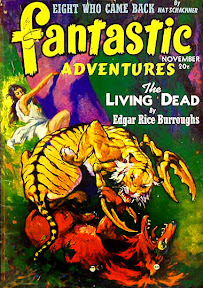 Dwight V. Swain's output in the 1950's pulps mostly left me unimpressed, but here he tackles good old "mad scientist unleashes a doom upon the world" story with great enjoyment. Sometimes there is a place and a craving for the classic fare, and this Wells / Gernsbeck-styled offering hits all the sweet spots. A universal solvent is unleashed this time, pretty impossible to contain, catch or eradicate. It dissolves, perfectly, everything in its path, and even when it hits the Rocky mountains, it does not stop there. Great visuals, and unexpectedly smooth entertainment from this writer.